This is our third year working with the Crown Estate on Regents Street Summer Streets. 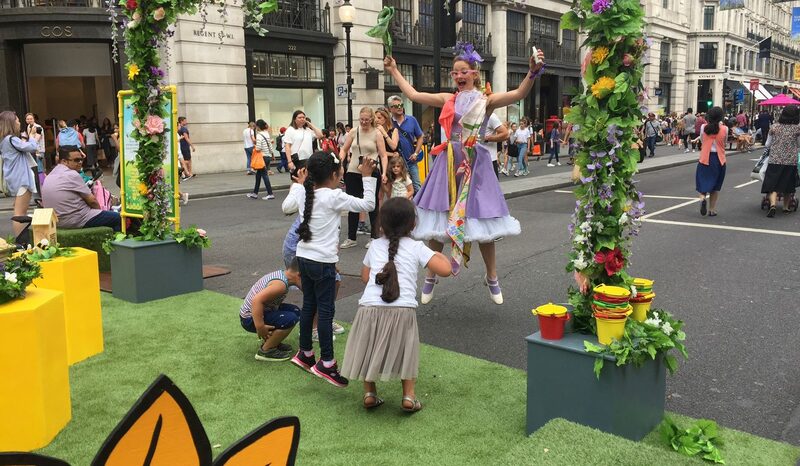 This year the Regent Street Hive became a buzzing focal point for families at the Crown Estate’s Summer Streets activity on four wonderful Sundays in July, when the Regents Street Association close the road to traffic and allow visitors to reclaim the street for the day! Families flocked to our summer garden set to enjoy immersive theatre interactions engaging children with the story of bees in our capital city. 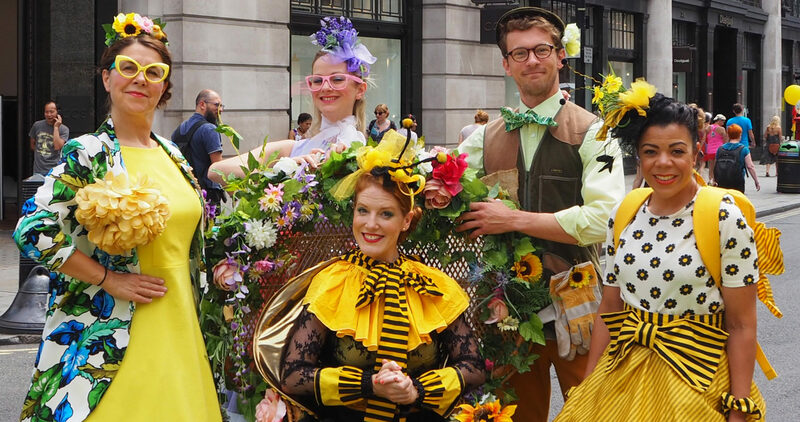 Four enchanting bee character performers wearing beautiful handmade costumes activated our summer garden themed set included a hexagonal bee maze with giant flowers, a high impact flower arch, selfie stations, nature throne, bee-themed props, games and bug hotel crafts PLUS hundreds of hardworking LIVE bees. The Crown Estate has a fascinating story to tell: how they support biodiversity in the big city, with natural rooftop flower highways allowing the bees to move between London’s green spaces. We wove biodiversity and sustainability messaging into immersive theatre experiences for children, to sow the seed about the important role bees play in our ecosystem and encourage visitors to help us #savethebees. With an engaging and creative craft activity, bug hotel making, and LIVE bees to meet with their expert keepers from Bermondsey Bees the bees certainly gained more friends!